How did everyone whether the total eclipse? We had cloud coverage, so sadly it was uneventful here. Well except for when I became so distracted, no wait, I mean focused, that i dunked my paintbrush into the coffee. That’s pretty good though, because last time it was wine! Have been working on several pieces at a time this past week… Some were experiments gone horribly wrong and others that pushed me in new directions. Lately I’m all about getting out of my comfort zone and getting away from that critical voice in my head that says “you’re not supposed to do that” or “that’s frowned upon”, or “that’s not what they taught us in school”. So my mission of late, is to un-learn and not listen to convention. Another thing that I’ve been drawn too lately is mark-making. SOOOOooooo abstract, but damn it is fun… And these days I can use all the fun I can get because the news is utterly depressing. They say the only thing constant in life is change and that resonates with me, especially these days… Maybe that’s how this painting came about? 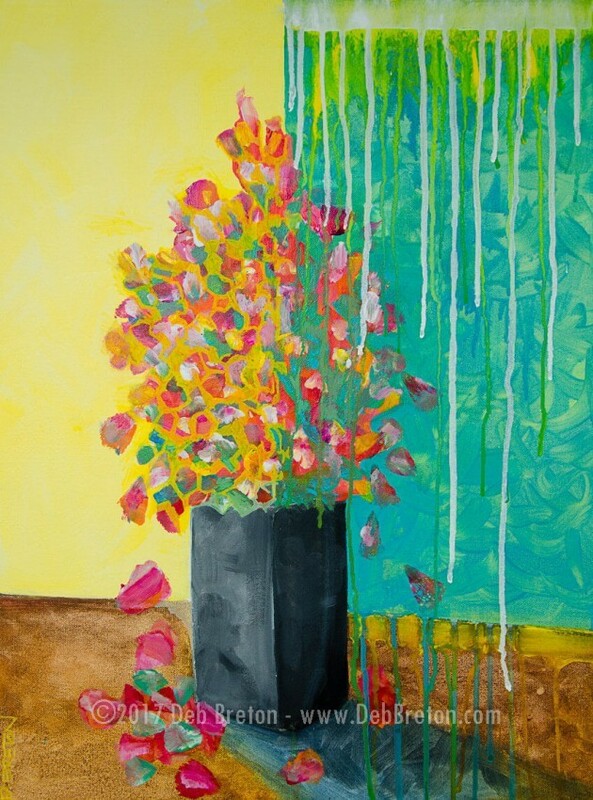 Nothing Lasts Forever Abstract Floral painting 18 x 24 x 1.5 gallery wrapped canvas. Montana Gold spray cans, love these too! Yeah, I know this is a discombobulated post, but if you take nothing else away from this – just paint what you feel and don’t listen to what you’ve always been told. Hugs and cheers – Prost! Yes, I’m grateful everyday for the space I have to create in…blessed… As for the paint storage idea, it came from someone’s blog post, wish I could remember who – so I could give them credit!!! It really makes things easier. Certainly, working more and worrying less can result in some great art.